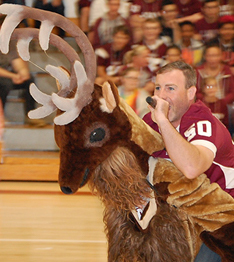 At Ridgway Middle/High School, we don’t limit opportunities for learning and inspiration to the inside of a classroom. We believe that another important aspect of student life is being involved in clubs and activities. Our clubs, led by enthusiastic instructors, allow students the opportunity to interact with their peers who share similar interests. 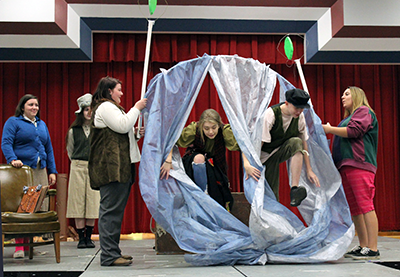 The RHS musical theatre class performed the a cappella musical, “The Commedia Pinocchio,” at Ridgmont, Pine Crest, and at the FSG Elementary school on October 31. In the photo below, Pinocchio (Olivia Matha) and Gepetto (Hunter Collins) are escaping through the whale's mouth as it snores. Our 2017 Ridgeway "Mighty Elker" Marching Band is off to a great start. This year’s show includes selections from Aladdin including "Arabian Nights," "One Jump," "Friend Like Me," "A Whole New World," and “Prince Ali." Please find our current band director and members listed below. Student clubs meet on Fridays. Please view our school calendar to stay updated on meeting times and locations.